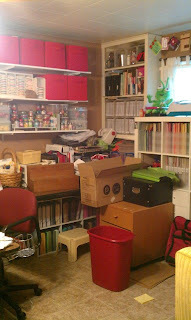 I shared some pics of the shelves I want to use in the scraproom yesterday and want to show you the mess I have now!! 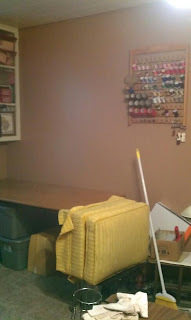 I know once I get done it is going to give me more floor space and I won't have crap piled up in one corner of my room...at least that is what I am hoping!! 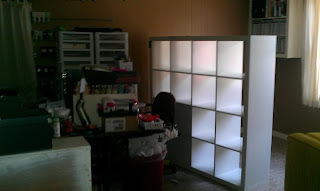 This first pictures is when I got my Ikea unit unloaded and stuff out of my wire shelves so I could move things around. I had all my paper on the kitchen table, setting in the wire shelves in the dining room and even some in my little bathroom...don't even ask!! I decided I wanted the Ikea unit in front of my window so I had to think of something to put on the back so sunlight won't fade my paper. I am one of those people that keeps boxes for electronics for a year in case something goes wrong. Luckily I still had my box for my 32" TV I got on black friday almost two years ago. It worked great and I just had to find a little more cardboard, and thanks to a priority box I hadn't thrown away I had it as well, to finish off the bottom two areas. I just used masking tape to put the cardboard in place so I didn't have to put nails into my shelving unit because let's face it, I never know when I might change my mind and do something else! I also decided I wanted another table in the room to put my machines on, eventually when I get it all done, and also to give me some more work space. I was able to put an 8' table where the Ikea Unit and the wire shelves were. I am still able to access the built in shelf easily. The upper shelves will be difficult to reach but I put things up there that I don't use as often. Once I got my table and unit in place I put the paper back where it goes. It took me awhile to find all the paper since I had it scattered everywhere. Notice the unit under the table, it was setting on top of the Ikea Unit when it was on the other wall. 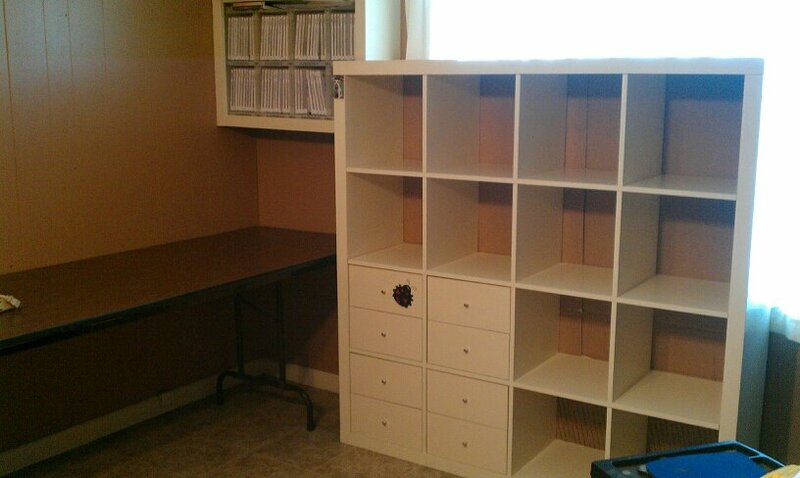 I had a big desk on the wall where I want to put the shelves I got earlier this week and I had to empty that wall. Here is a picture of the wall where the new shelves will go. I am going to have to do some serious reorganization once I get the new shelves in place but ya'll know good and well that I love to reorganize *okie thinks it might be a sickness at this point, but doesn't worry about it since it is only pertaining to her crafting supplies*. There were totes under the desk that will have to be emptied and the contents organized. This will let me access the contents a lot better on the new shelves without having to dig under the desk and drag out all the totes. And here is a picture of all the crap that was on, under and around the desk in the picture above. I tell ya sometimes it has to get a lot worse before it gets any better! LOL I am not sure if the stuff I have on the shelves I put above the table on the wall will stay there. I am still working on trying to figure all that out and since I will have some extra time this summer I will get it done *okie wonders if she should just take next week off to get it done*. I was going to paint the shelves I got but I don't think they really need to be painted. There are some little rust spots but I am using a brillo pad and scrubbing it off. I don't think I can stand to have everything strung out that long and right now my house looks something similar to Hoarders and it is going to drive me insane! I will post more pictures as I progress and when I get everything completely done I might make a video of the room. I am sure it will be a little while before that happens though!! Can't wait to ee it when it's finished! TFS. Looking good. Want come organize my room for me. :) Someday it will get done right whatever right may be. Don't work too hard. Later. I love the idea of having all of your machines on a table. Much more likely to use them if I don't have to drag them out and put them up every time. Great shelving Shirley! I hope you do a video of your room, I would so love to see it as would everyone else! Have fun!! I so want to take a road trip to Ikea, almost a 4 hr drive for me from my little piece of Okieland. and I need the extra storage sooo bad. I organized by space a few months back (or so I thought) when I refinished an old dresser with shelves. 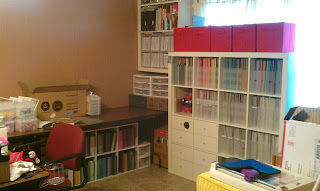 Love the way it turned out draws are all full, shelves not so much, to wide for most thing not wide enough for paper. CRAP. Plus it is on the otherside of the room from my desk, not to smart on my part. so, right now I walk in there and go; how do I want to re-rearrange this?? Then get pissed and walk out. I have a single car garage that was enclosed a few yrs back with one little window, so not much light. when I enclosed the garage door I put up rope lighting around the room for light, because it was suppose to be a temp. enclosure. But once the teenage went to college the other 2 left at home claimed it as a game/video room. worked out great for me and the hubs, NO more 6 to 10 teenagers in my livingroom. Now that I am down to the last teenager (SR YR YEAH!!) 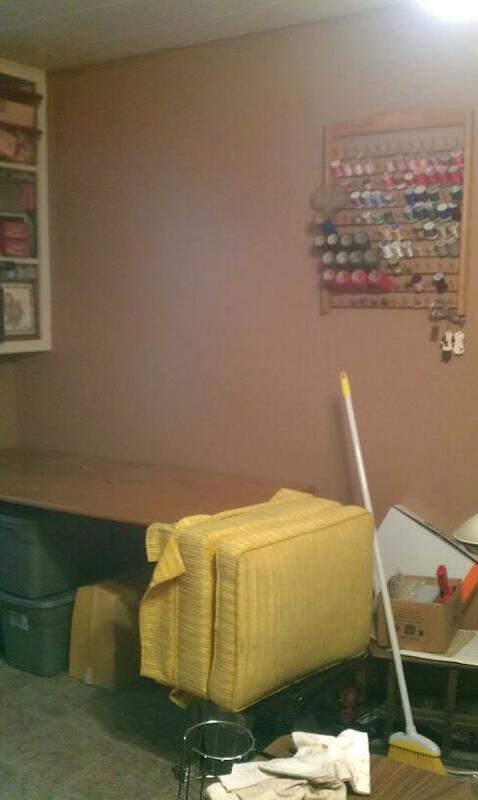 I claimed the room for an office and craftroom, sorry I am from the South and feel I have to tell you the whole story, haha. I hav two shop lights for the major lighting, again enclosed garage, no ceiling lighting put two plug ins (really??) and no air, for the most part I have the air thing under control. I share my room with the deep freeze, a storage closet for hunting clothes, various hunting stuff, weight machine and 3 saddles. 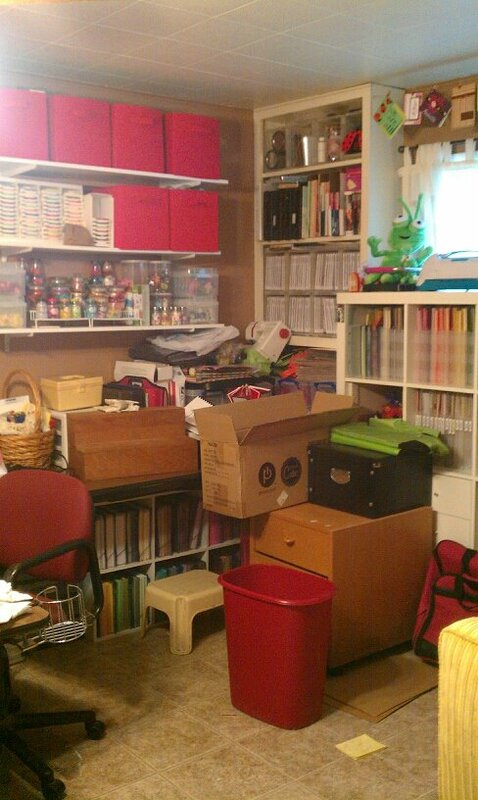 I actually have 3/4 of the room, cuz all the before mentioned crap is crammed to the back of the room. Yes Yes, OK, the freezer is mine as are 2 of the 3 saddles and some of the hunting stuff. And the weight machine I swear I am gonna use, haha made myself laugh out loud!! I am telling you all this so YOU can tell me where in the HE "LL do I start this process in orangizing. I need help. Where do I start?? ?